[dropcap size=big]A[/dropcap]h, zombies. They’re practically everywhere at this point, shambling their way into virtually every form of media. 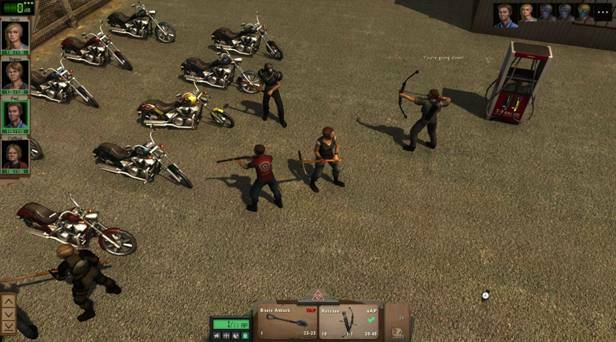 DoubleBear Productions have taken a bite out of the CRPG genre with Dead State, a RPG set in the midst of a zombie outbreak. But is it a worthy entry into the annals of roleplaying games? The answer is yes, yes it is. Dead State a good game, but it’s somewhat rough around the edges. The game is extraordinarily compelling (no doubt thanks to the contributions of Brian Mitsoda, who also wrote Vampire: The Masquerade – Bloodlines). Every recruitable NPC (of which there are many) in Dead State is three dimensional, with virtually no flat or otherwise stereotypical characters. 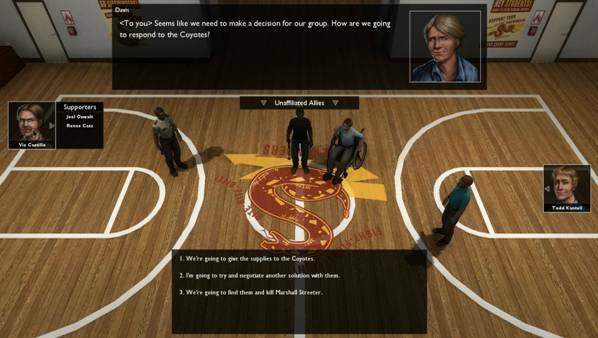 The player is given a wide variety of ways to approach dialogue trees, as well as important crisis events that occasionally spring up. 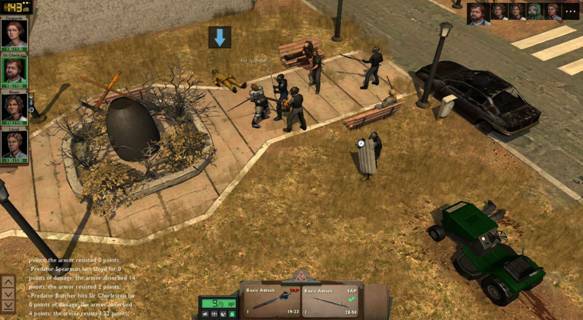 Dead State’s gameplay is very similar to the older Fallout titles. You travel on a world map to various locations. Upon arriving to your destination, you explore it in real time until combat starts. When you ultimately encounter hostile NPCs, the game shifts into a turn-based mode with action points. There’s one glaring issue with the combat system, one that I hope the developers fix in the upcoming patch: the noise mechanic. Whenever you hit something (or fire a gun), you increase the noise meter. When the noise meter goes up, you draw the attention of other NPCs close by. When the meter gets too high, zombies spawn at the edges of the map. Sounds nice, right? Well, occasionally Dead State glitches out and spawns zombies right next to your characters. At one point, I was clearing zombies out of an area; while dispatching the last two, I made a large amount of noise resulting in a crowd of zombies spawning dead ahead of my party. In addition to that, pathfinding for NPCs is somewhat poor, with party members sometimes taking an extremely long route to get to an area while my PC goes the normal way. Dead State is filled with content. There’s a staggering amount of locations you can stumble upon, party members to recruit, and zombies to put down. Each location normally took me around fifteen minutes to explore, with larger locations sometimes taking as long as an hour. However, this brings me to another negative point: after a while, the game starts to feel very repetitive. There’s only so many times you can find a location, fight the zombies or hostile survivors in it, and scavenge it for supplies before it starts to feel very routine. 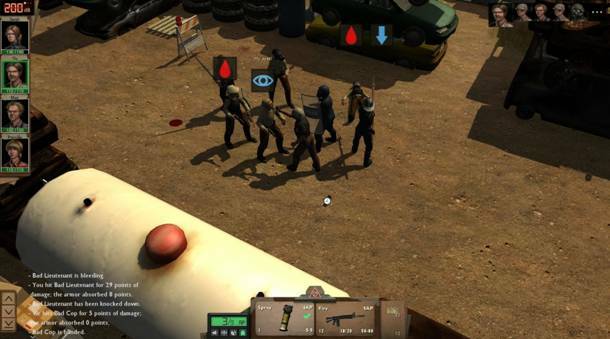 The base management mechanics break up the monotony somewhat, with the player being able to upgrade their headquarters and assign the survivors in it to various tasks. If you’re interested in a well-written CRPG, and you’re willing to look past the occasional glitch and somewhat repetitive gameplay, I highly advise you to pick up Dead State. I enjoyed my time with the game, and the developers have released several patches so far to curb the bugs. The next patch is supposed to add in new content alongside the bug squashing, and I’m curious to see what they plan on adding in. Raised on a steady supply of superhero cartoons, videogames, and heavy metal Taylor Woolstenhulme was destined to have a lifelong love affair with everything geek. Fascinated by the possibilities of emergent gameplay; Taylor's favorite genres include the non-explosive kind of RPG, grand strategy, and open world sandboxes. He lives in sunny California, and hopes to pursue writing as a full-time career.